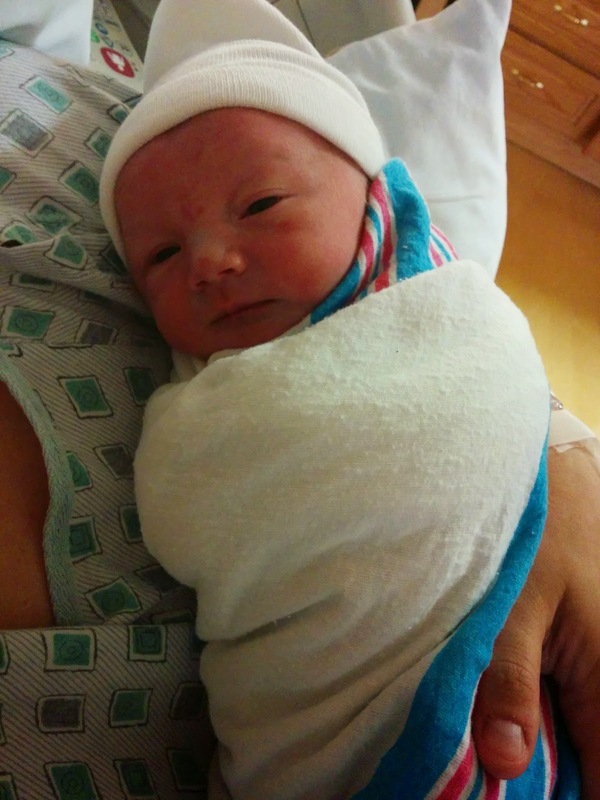 This will have it's own post to come, but I had to start with a picture of my little runner. She had so much fun and we are so proud of her. 2. 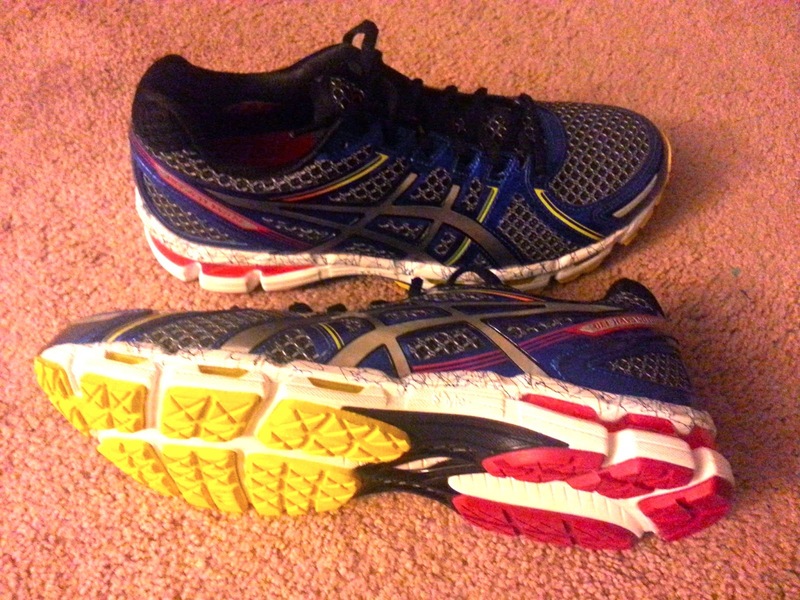 My First "Real" Running Shoes. When I finally took the running plunge, I did what everyone said. 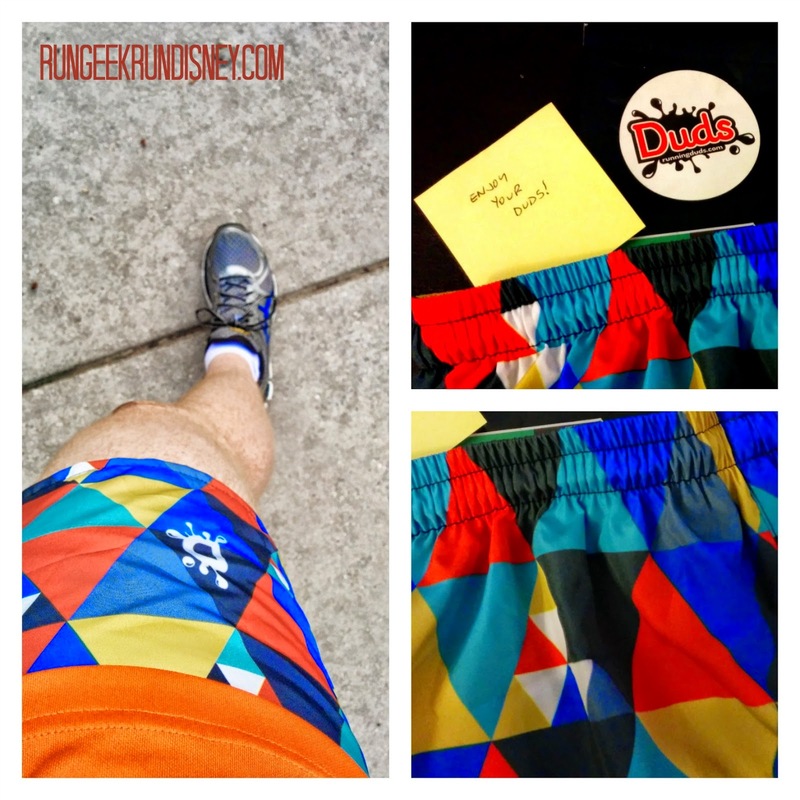 I went to my running store, got fitted, tried on a bunch and picked the ones that felt best. Of course, I had to pick a stand out pair. And now, they've been retired into an every day shoe. 3. My Moment in runDisney. This picture was my short lived moment of runDisney fame. 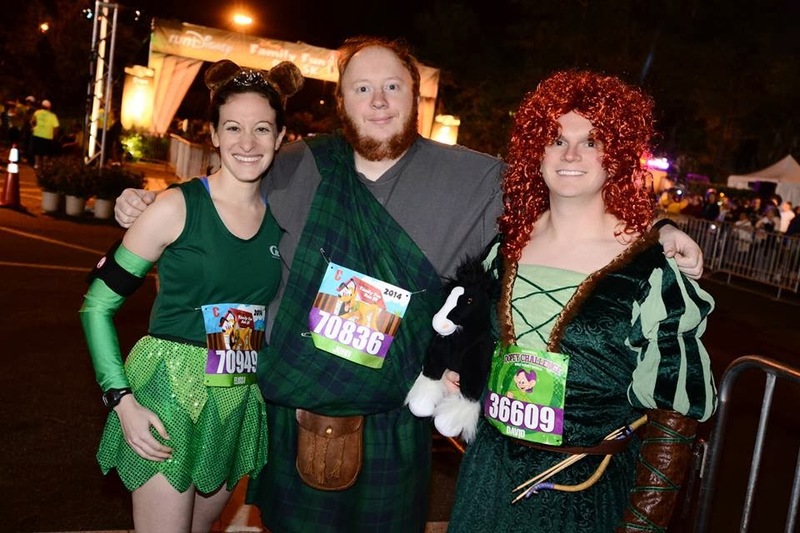 I was featured on the runDisney blog (and reappearing recently on their Facebook page for princess costumes) with Elissa and Princess Meridave. It was a proud moment. Still love the kilt. 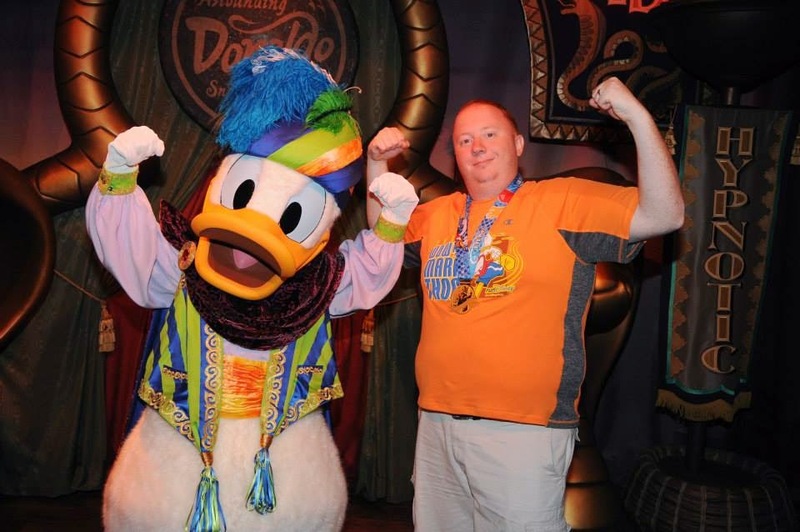 My first half, my huge goal, was the 2014 Walt Disney World Half Marathon. The bling earned is a Donald medal. After which, I was sure to get a photo op with the duck himself in Storybook Circus. Man, I love Disney. And we end where it began. 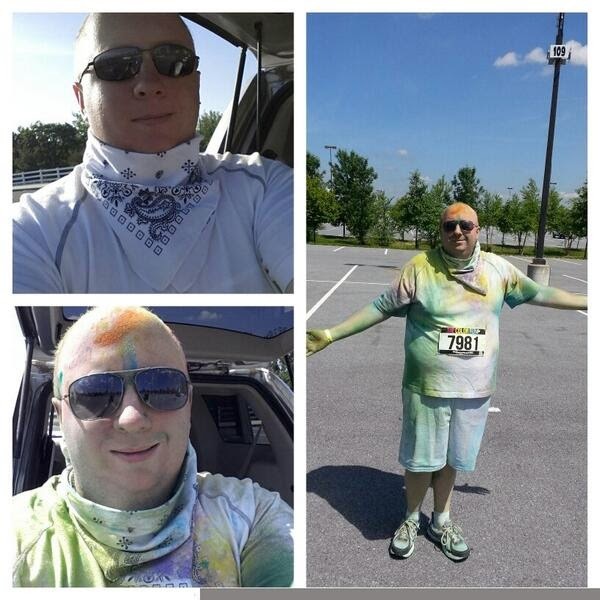 My first race was the Rockstar 8K. Like, first race EVER. Read about it here. My first race down the road to being hooked. This was another of my several short races in a row I had lined up. 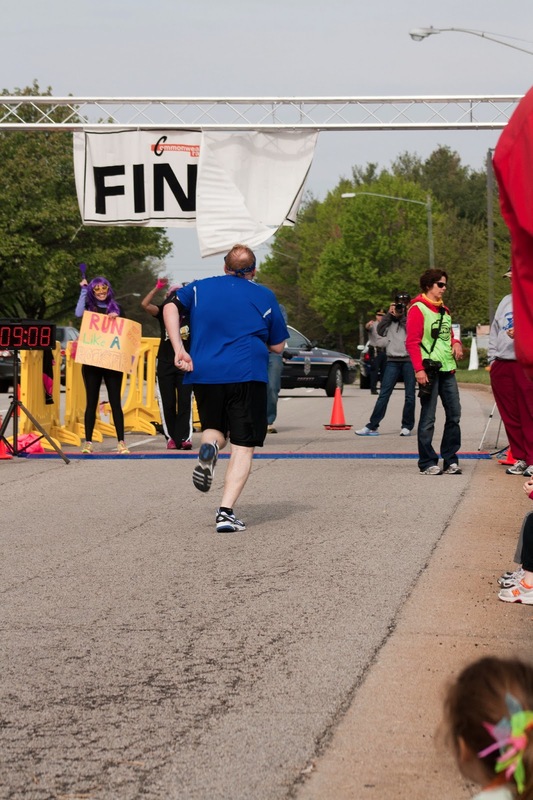 This is also my first "fun run" non-conventional race. No timing chip, not really on a road / path and the added element of colored powder flying around. The race as a little more on the "fun", a little less on the "run". 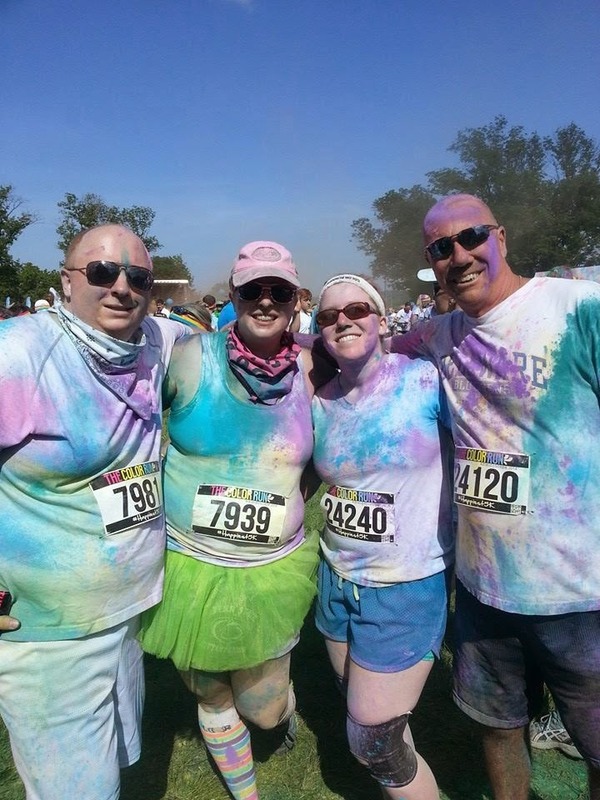 The Color Run bills itself as the "Happiest 5K on the Planet". It was definitely set up to be all about having some fun and trying things out you might not otherwise do (like a 5K for some). The pre-run area was definitely set up as so. There music, bubbles, colorful backdrops for pictures and even Zumba to help you get warmed up. I was running the race with my sister for her birthday and with two others from back home. The group aspect made it fun. With an even larger group, I could see how it would be even more fun. A little before and after coloring. When it came time to run, there were no corrals. Instead, there was essentially a giant corral that everyone made there way into and then just wait in as they slowly let groups out onto the course. While waiting, there was music, people throwing out free stuff and 2 mic men to keep you dancing and having a good time, so it wasn't all bad. It did feel like it took a while, but in actuality, I have no idea how long it was, because I had on no watch and no phone. My guess was about 20 - 30 minutes until we got to start off. The course itself was, how do you say, "less than ideal". It was just outside Hershey Park, which was convenient for their parking. However, the course was all just up and down grassy hills. Some were a little steeper than others. For this reason, coupled with the people in the group, we ended up walking most of it, only jogging a couple times. I'd say at least 75% of the people were walking the majority, though they left a path to the left for runners. If you add in some people with bad knees on a grassy downhill slope getting stomped down by 10,000 people, you'll end up going a little slower. Even though we did walk, it didn't really feel slow or dragging. The color portions were mostly fun. The colors were corn starch and coloring, so when you came out the other end, it would smell a lot like Fritos. Some people were better at distributing the color than others. Usually it was pretty good. We looked forward to it in the group for what would be next. A splash of pink here, so blue over there and a dash of yellow on top. The post race party is one of the things that sells this race on people. It's basically a big dance party, with colors flying, music blasting and people dancing. I stayed to the outside and enjoyed the music while my sister jumped into the fray. In addition, they had picture opportunities, food trucks and various sample. My favorite included free KIND bars. I just love them and they were perfect for post race. At the end of the day, I did have a good time. I attribute a lot of that to the company. Looking back, I wasn't overly impressed with the race as a whole. The swag was ok. You got a shirt with a nice design of soft cotton, a wrist band, some stickers and tattoos and an over the shoulder Color Run bag that everything came in. The bag was fairly useful seeming, but I used it for the second time to throw an extra shirt and shoes in for after a recent race and it ripped, so short lived. The lack of any corral instead with one large chute made for a long start. The start area did have more than enough bathrooms and hand washing stations, which was a nice touch. The course was rough: the up and down and the packed grass that I can only imagine would get worse as the day went on. This really took away from the overall grade, and the biggest part that could be easily improved. The party at the end was good, but not really my style. Maybe, a stretch but depending on the group to do it with. Is it my "cup of tea"? 1. 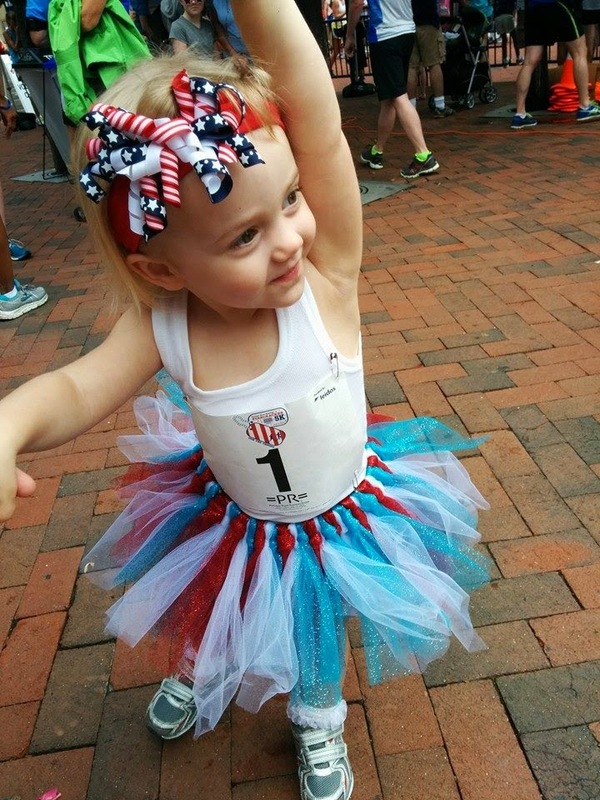 This 4th, my daughter will run her first race! I've written about this before, but I'm still excited for it AND it's on the 4th, so deal with it. Or skip it. Or read that she's running the kids race at the Firecracker 5K in Reston. It's free and she'll get her own bib and medal. I think it's awesome that Potomac River Running does that for the kids. There will be plenty of pictures and a write up to follow. 2. 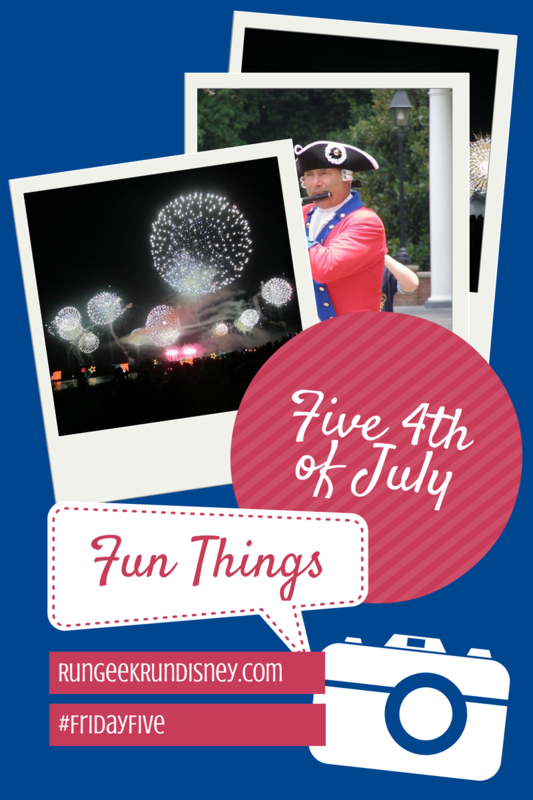 I honeymooned in Disney on the 4th. My wedding day was on July 3, 2010. That does in fact mean I am writing this on my anniversary, but I'm writing in bed next to my wife, so it's ok. The next day, we flew to the most magical place on earth. Yes, Disney World. We watched the 4th of July fireworks from our room at the Polynesian that had a view of Cinderella's castle. The whole trip was amazing. I highly recommend honeymooning at WDW. 3. We've spent half of our anniversaries in WDW as well. Two of four is half. It hasn't been a planned "let's go for our anniversary". It just lined up with our families' trips that we ended up there at that time, which worked out wonderfully. The one trip, for our anniversary, we had the most delicious meal I have ever eaten. We ate at Victoria & Albert's. V&A is Disney's Five Diamond Award restaurant. We had a chef selected 8 or 10 courses that included Wagyu beef that will never be matched. That is until some day I get to eat at the chef's table. Excuse me. The foodie in me needs a pause for the cause. 4. I do love when fireworks are set to classical music. I have a love for music. All kinds. I do prefer where fireworks for the 4th are set to classical and marches over pop music. Just feels like a better fit. That could be just me, but that's what this ginger likes.